Sounds of Brownsville (SOB) is a project of the Brownsville Community Justice Center. 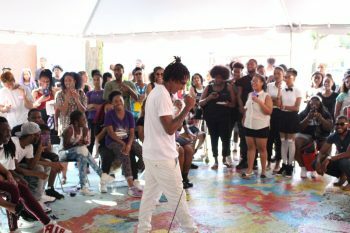 SOB is a youth-led music collective that seeks to reduce community violence by engaging those at the center of this violence, providing opportunities in the music industry, and promoting positive youth culture through music production and cultural events. Young people work with experienced teaching artists and producers, develop their artistic abilities, and create alternative community narratives. Participants also receive holistic individual support to address barriers to their success.